The week started at SPX 2767. After a lower open on Monday and a trade down to SPX 2749. The market gapped up on Tuesday, and then hit SPX 2817 midday Wednesday. A gap down opening on Thursday took the SPX down to 2755, where it was trading on Monday. Then a gap up opening on Friday rallied the SPX to 2798 early morning, which was sold off for the rest of the day. For the week the SPX/DOW gained 0.20%, and the NDX/NAZ lost 0.65%. Economic reports for the week were mostly positive. On the downtick: housing starts, building permits, existing home sales, and the Philly FED. On the uptick: leading indicators, the NAHB, industrial production, retail sales, the NY FED, business inventories, plus jobless claims and the federal budget improved. Next week’s reports will be highlighted by the beige book and Q3 GDP. Best to your week! Despite a volatile week not much has changed from last weekend’s report. The market traded above last week’s SPX 2711 low, and well below the SPX 2941 all-time high. The range for the week was SPX: 2749-2817. And the SPX gained 1 point for the week. The SPX weekly chart displays the Major wave 1 bull market count from February 2016 to October 2018. Notice the five wave rise from the Primary II bear market low at SPX 1810, to the Major wave 1 high at SPX 2941. Five Intermediate waves, with five Minor waves creating a subdividing Intermediate wave iii. Intermediate ii was an irregular zigzag, and Intermediate iv was a flat. Minor 2 was complex and Minor 4 was simple. Alternation on every level. Same can be said for the DOW, NDX and NAZ chart patterns. They all mimicked each other, while at times not completely in sync. While the last uptrend left a lot to be desired as for impulsivity. It was still tracked as Intermediate wave v, and expected to be the last uptrend of the bull market. We had noted months ago. If the uptrend surged it could pass SPX 3000 easily. If the uptrend struggled and took lots of time it would probably make only marginal new highs. The uptrend took six months, and exceeded the previous all-time high by only 2.4%. The DOW only exceeded its high by 1.2%. Thus far the market has dropped from SPX 2941 to SPX 2711. We had thought that could be an important low, and so far it is holding as such. We labeled that low Minute wave A in dark green on the charts. 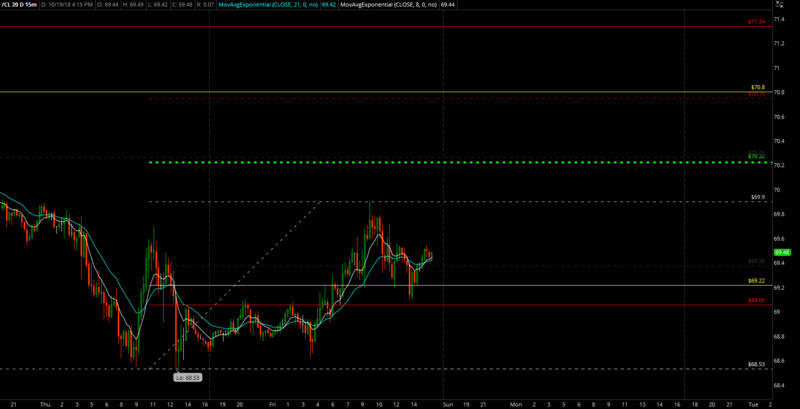 The rally that followed has thus far risen to SPX 2817 for nearly a 50% retracement. We have labeled that with a tentative light green Minute B. So far the decline is moving along generally as expected. With Minute A SPX 2941-2711 (230 points), and Minute B reaching SPX 2817 (106 points), we would now expect Minute C to decline either 0.618 Minute A (2675), or 1.0 Minute A (2587). There are pivots at 2656, 2632 and 2594. Once the market does hit one of those lows it should end this Minor wave A downtrend. 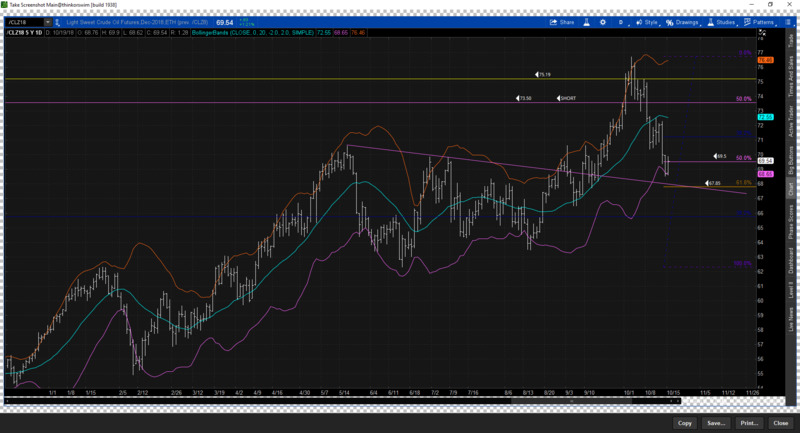 Then we would expect a Minor B uptrend retracing 50% to 61.8% of the entire decline. After that we probably won’t be seeing those levels again for some time as the bear market begins to make itself more widely known. If things really get carried away. Which is possible considering the multiples. The FED will be forced to intervene: MM4ME. Short term support is at the 2731 and 2656 pivots, with resistance at the 2780 and 2798 pivots. Short term momentum ended the week just above oversold. Best to your trading! It’s a day traders market. Asian markets were mostly lower for the week for a net loss of 0.7%. European markets were mixed and gained 0.3%. The DJ World index lost 0.1%, and the NYSE gained 0.1%. Bonds continue to downtrend and lost 0.2% on the week. Crude appears to be in a downtrend and lost 3.7% on the week. Gold remains in an uptrend and gained 0.6%. The USD is also in an uptrend and gained 0.8%. Wednesday: new homes sales and the Beige book. Thursday: weekly jobless claims, durable goods, and pending home sales. Friday: Q3 GDP and consumer sentiment. 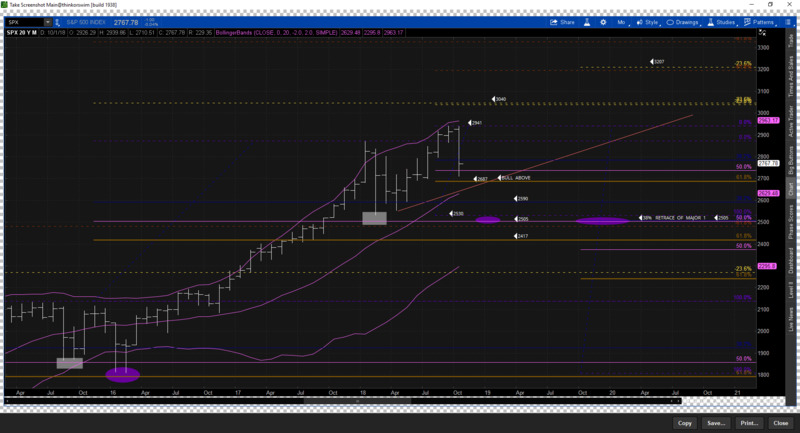 This entry was posted in weekend update and tagged elliott wave, investing, markets, OEW. Bookmark the permalink. TJ has five waves down … but what if the wave is not complete? CL monthly pivot pattern remains in play, failure of the pattern could suggest change in trend as it has historically (daily chart). Although the yearly breakout remains key support (weekly chart). Staying long but definitely on my toes. As I mentioned earlier, may bounce to 72 area before dropping to 66. Mon/Tue morning could be just that – a bounce. 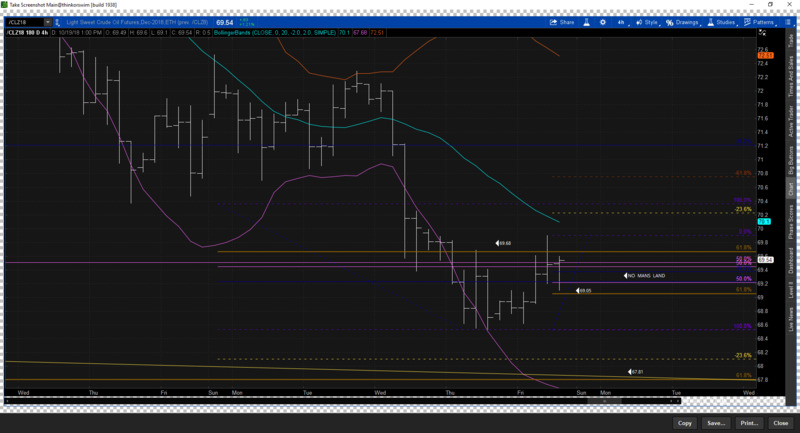 Don’t trade CL but from a DH disciple, CL tested and defended the 61.8% LONG. The profit target of this measured move long is $70.22. There are higher targets…I.e. the 50% and 61.8% SHORTS…(thin red lines). I read a report, in a recent stay at a recent stay at a Holiday Inn (LOL) that energy stocks peak around the top in equities. Watching energy closely…. The monthly S&P500 Emini futures candlestick chart has a big bear bar so far for October. However, it followed a 6 bar bull micro channel. Furthermore, the double top with the January high only has 9 bars. That is probably too small to reverse the 2 year tight bull channel. Since the double top is small compared to the strong 2 year bull trend, this month’s selloff is probably a minor reversal. Therefore, a trading range or bull flag is more likely than a bear trend. The minimum 1st target is a test of the 20 month EMA at 2638. If the Emini gets there this year, it will also fall below the 2689.75 close of last year. Because the bear bar so far is surprisingly big and it followed a strong 6 month rally, traders are confused. Big Up, Big Down, creates Big Confusion. The only thing that traders believe is likely is that the next couple of months will not go far up or down. Traders will take quick profits and bet on reversals. This will probably result in at least a few more sideways months. If instead this month is a bear trap and the market quickly rallies to a new high, the high will probably be brief. The strong selling in February and again in October represent a market in transition. Instead of a strong bull trend, the monthly chart is evolving into a trading range. There will probably be sellers above the September high. This would create a small wedge top. In addition, there will be buyers below the February low. The result of buying low, selling high, and taking quick profits will be a trading range. The weekly S&P500 Emini futures candlestick chart formed a doji inside bar this week after last week’s big bear breakout. This week’s doji inside bar represents an absence of follow-through selling after last week’s bear Surprise Bar. Because there was no follow-through selling, traders will conclude that the selloff will probably be a bear leg in a trading range and not the start of a bear trend. However, the bottom of the range might be all the way down at the February low. This is what traders will discover over the next few weeks. If the bears get more big bear bars, and especially consecutive big bear bars, the odds will favor a test of the February low. Alternatively, if the Emini reverses up strongly next week or from below last year’s close, traders will conclude that last week’s selloff was a bear trap. Traders would conclude that the selling was caused by options selling firms having to hedge in a falling market (see last week’s post). This is in contrast to some fundamental change in the market, which would result in protracted selling over the next several months. But, the prospect over the next year is unchanged. This is more likely a trading range than the start of a bear trend. Therefore, even if the Emini falls to the February low, it will probably not fall much further. In addition, the odds still favor a move above 3,000, and possibly to the measured move targets around 3100 and 3200, before the weekly chart will enter a bear trend. 2417 is meaningless. The number that matters is 2493, because if the market goes below that number, then that would completely invalidate Tony’s count. The EW principle of degrees means that smaller degree waves have to literally be smaller than the prior larger degree waves, and if the market were to go below 2493, then that would make Tony’s major 2 larger than his Primary 2, thereby invalidating the count. “08/10/2018 – Composite leading indicators (CLIs), designed to anticipate turning points in economic activity relative to trend six to nine months ahead, continue to point to easing growth momentum in the OECD area as a whole. Slower economic growth but stabilizing is the picture from China as well. Europe and Asia have been leading the declines. In Asia the HSI and HSCEI are now on good support. There are signs of life. Nikkei the same and the Dollar Yen which is generally risk off has a clear corrective abcxabc off the high rather than a impulsive decline. In Europe and around 2-3% lower it’s likely we see a rally. Dax is showing a head and shoulders top. It would be unusual if that pattern printed before next year. I don’t see a collapse until then. Another reason for not expecting a straight down move is that the S&P decline is not faster in price or time than than the January decline + there is probably more pain for hedge fund performance in 2018 if S&P finishes +8 for the year rather than flat. Knowing the difficulty in calling a ATH in anything another move up into 3050 makes most sense. The Jan correction to now will look like a continuation abc pattern with a weak wave c and everybody will either be long again or have limited short exposure. It is also possible we just chop with just a marginally higher bias until 2019 but I am struggling to see the impulsive wave down trade until next year especially into positive mid nov cycle. Next weak may be weak and Europe -2% or so and then I would get long to close out the trade into Jan.
Mass exodus and the pickture on the bridge of population leaving. As in the stock-market as in life when a strong collective force marches on, there is very little left to gain on the move. A succers rally, if you like. Bananas, coffe and agriculture could be very close to a turn. Better days for the 3 RD, world lets hope so. And close to a turn also n the middle east. Lets trust the universe. Problem is when very poor countries are getting richer, more of the poor can afford traveling northwards. Pakistan and Philippines are not among the poorest nations, but they are big exporters of people around the globe. Africa south of Sahara is not a big exporter yet with a few exceptions. But this can change a lot in the future. Perhaps there will be more Trumps around – and walls. They came….but didn’t go on welfare, food stamps or government healthcare. They also came to this country within the parameters of our laws and they assimilated. Immigration without assimilation is invasion. Illegal immigration is also an invasion. hmmm… I do not recall the indigenous people of the US , Canada, Australia, NZ or South Africa or South America who had a 30,000 history inviting the Europeans to come. Can you? The Europeans have been in those countries for 250 years or less. We have to admit that it is a truth. Many years ago my grandpa was an illegal immigrant to US. His friend had a sailboat which 10 guys used for their trip from Europe to Long island outside NYC. No police were around. They sold the boat and went by train to Chicago where they worked in construction for 7 years. Then they travelled home again most of them, with dollars in their pockets. Easy come, easy go. Previously there were jobs in the West, but they were shipped to Asia. Now the West has a Service economy, clerks, bartenders and public support functions. Here in Norway immigrants need to bribe in order to even be considered for a job…Margins in the private sector has vanished due to rising taxes and exuberance in the public sector. The system needs a reset. Expansion of Europe led to our country’s development.If that hadn’t happened,we would not have progressed to this place we are at now.The smartest and most adventurous survive and evolve.Darwin,anyone? In tbe 20s and 30s,again,the US,with still a relatively low population,didn’t prevent the influx of Europeans.It was to our benefit to have hard working people come in. At that time,the US population was 90-95% white. It’s insane.400 years ago,at least the Indians went down fighting.Today,as white people are being denounced everywhere(media,Hollywood,politics),for the purposes of being replaced,it looks like fighting back is the last thing we want to do.That attitude had better change soon. +1billion!! Salvini,Lepen,Kurtz,AfD,Wilders,Orban the brothers Kaczynski etc etc the winds of change blowing hard. Market Trend Trading opportunites while monitoring the trend and risk. The Market Oracle We present in-depth analysis from over 600 experienced analysts on multiple views of the probable direction of the financial markets.